8 Bit Guy does a great job de-mystifying the LCD displays that we have been using. I've been hearing about this rig for many years. 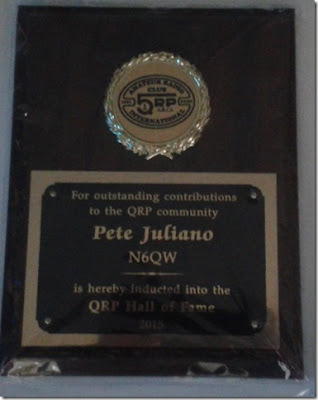 It first appeared in the September 1994 issue of QRPp, the journal of the NORCAL QRP club. A condensed version of that article appeared in SPRAT 81 (Winter 94-95). The designer is Derry Spittle VE7QK from Vancouver, British Columbia. The name always puzzled me. Here is the explanation: It started with the Neophyte: A very simple direct conversion receiver that many of us built. The Neophyte was mostly an NE602 and an LM386. In the Epiphyte, a crystal filter and a second NE602 were added, turning the Neophytes into a superhet receiver and -- with some additional circuitry -- an SSB transceiver. The Oxford English Dictionary reportedly defines an Epiphyte as "a plant that grows on another plant"(see picture below). The Epiphyte grew out of the Neophyte. And this plant grew in British Columbia, which seems -- like Australia and New Zealand -- to be fertile ground for simple phone rigs. I'm pretty sure the "Wee Willy" DSB rig also came out of BC, and it may have had a similar purpose: allowing for portable contact with the BC Public Service Net on 75 Meters. There are many features of the Epiphyte that I like: There is a simple 455 kHz filter and a ceramic resonator BFO/Carrier oscillator. The original design featured a VXO-like circuit using a ceramic resonator at 4.19 MHz. 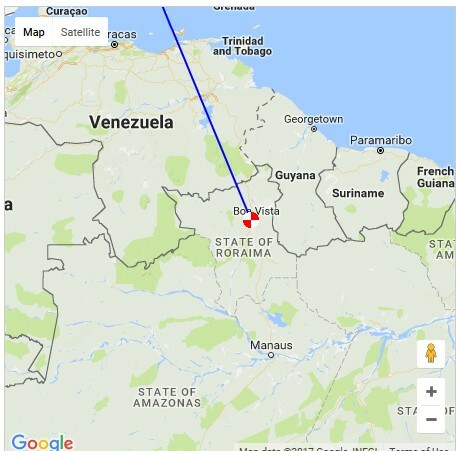 And it ran off AA batteries (as did the NE602 DSB rig I took to the Dominican Republic). Unlike my NE602 rig, the Epiphyte made an artful use of the fact that NE602's can be set up to have TWO inputs and TWO outputs. Where I used DPDT relays to switch inputs and outputs from both NE602s, OM Spittle left all the inputs and outputs connected, and simply switched the VFO and BFO signals. Ingenious. There were updates and improvements. The Epiphyte 2 and 3 featured increased power out (5 watts vs. 1 Watt). Version 3 has an IRF-510 in the final, driven by a CA3020A chip. That chip is capable of 70 db gain. Wow. 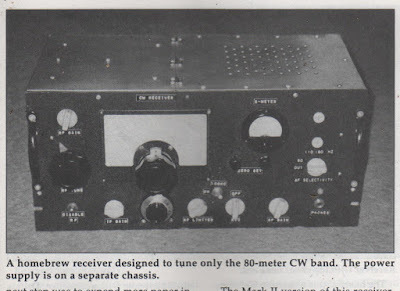 In 1996 NORCAL and G-QRP donated 50 EP-2 kits to radio amateurs in third world countries. Very nice. And above we have a video from Japan of an EP-3 in action. This was the icing on the cake. Ruben AC2RJ up in New York was monitoring as I called CQ with my BITX Digi-Tia last night on 40 meters. He recorded the contacts that ensued. I was really glad that he recorded VE3XBO describing his experiences with a BITX 40 Module at his local radio club -- The WAX Group of the Barrie Radio Club in Ontario. Farhan's module is really starting to show up more often on the band. 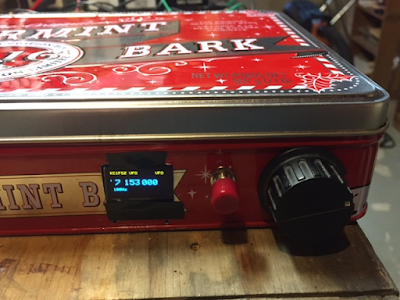 On the 19th of April I talked to Bruce KC1FSZ -- he was on his Peppermint Bark BITX 40. And on March 30 I talked to Josh KE8CPD on his BITX 40. Pete would call this a DiFX: a transceiver that is Different from a BITX. This started with my effort to get an Si5351 working with a little 1 inch square OLED screen. Tom Hall AK2B helped me with the software (thanks Tom). Once I got that done, I figured I could build a simple receiver with a homebrew 11 MHz crystal filter, two NE602 chips, and an LM386 AF amplifier. That was working great, then Pete told me to turn it into a transceiver. I used some of Pete's boards (thanks Pete). The Epiphyte transceivers also use two NE602's, but they ingeniously switch the BFO and VFO between the two chips. I didn't switch the oscillators -- instead I switched the inputs and outputs of the two chips using two DPDT relays (thanks Jim). A third DPDT relay switches the antenna between T and R, and turns on and off the PA stage and the AF amplifier. This is a DIFX, but there is some BITX circuitry in there. The power amplifier stages are right out of the BITX Module, as is the AF amplifier (thank again Farhan). The only real problem I ran into had to do with the very low power out of the NE602 VFO mixer on transmit and the impedance matching between the NE602 and the PA chain. I had to increase the gain on the first RF amp (pre-driver) using ideas from Steve Weber's 40 meter SSB CW QST contest rig (thanks Steve). I experimented with various connections between the NE602 and the BP filter. Finally I got it going. The heat sink on this one is different too: it is just the chassis. The IRF 510 is bolted (insulated) to the aluminum box. I fired it up this afternoon and in spite of horrible conditions on 40, quickly had a nice rag chew with KJ4ZMV in Indiana. I haven't even built a mic amp yet! I am running the D-104 right into the NE602 balance modulator. There are no signs of unwanted modulation or spurs. FB! TRGHS! VIVE LA DIFFERENCE! I had in my files somewhere this great article by Joseph Carr K4IPV about the design of ham band VFOs, but then I lost it. Yesterday I found it, but the paper copy was in bad shape. Internet to the rescue! Here it is. Go to page 79. Something I heard on 75 meter AM this morning may have gotten me thinking about VFOs: I hear that International Crystals is going out of business. That might be the last manufacturer willing to make bespoke crystals. If that is true, that has big implications for homebrewers. We will now have to build stable VFOs or succumb to the siren song of the digi synthesizers. "L and C FOREVER!" Joe Carr K4IPV mad so many contributions to the radio art. 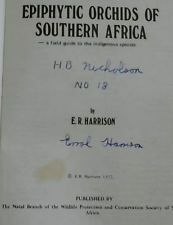 I have several of his books. He had a real talent for explaining circuits. Sadly, I find very little information about him on the internet. I know he lived in the same Virginia town that I live in. Does anyone know anything else about Joe Carr? I spotted this on Hack-A-Day. It caught my attention because many time, while riding my bike along the Washington and Old Dominion bike path, I have felt electrical shocks from the handlebars. Now, before you all conclude that OM Bill is losing it and start suggesting that I wear an aluminum foil hat, realize that the bike path is directly under some seriously high voltage power lines. And that esteemed UK newspaper "The Daily Mail" confirms that these shocks are, as the kids say, a thing. Very cool video. We have visited VE7ZWZ's amazing shack before. This time he takes us inside a BIG commercial AM transmitter that he has modified for use on the amateur bands. I know that he had the plate voltage turned off, but I still felt myself cringing when he reached up to touch the plate connectors on those enormous thermatrons. The filaments were on, adding to my unease. Dude, don't do that! And if you are standing INSIDE the transmitter, keeping one hand behind your back might not be as beneficial as it normally would be. His comments on his VFO were interesting. I was kind of disappointed that he went with a varactor circuit. A varactor? Amidst all those bread slicer variable caps? It just doesn't seem right. (And BTW they are bread slicers, NOT "potato slicers.") But I kind of liked the heater--thermistor--insulation set up that keeps the VFO at constant temperature. I thought it was interesting that these transmitters were kept on, with the tubes glowing for years at a time. Thanks Mr. Carlson, for another great video! I think Mike's video does a good job of showing what it is really like to get on the air with simple, homebrew QRP gear. It takes some patience and operating skill. I guess it is sort of like fly fishing (with home made lures); there are easier ways to catch fish, but they are not as rewarding. 7,744 circular dipoles on 843 MHz feeding 176 preamplifiers and 88 IF amplifiers!